Jooce has introduced a new web system based on flash. They are promising to plug-in a whole new generation of mobile internet users. Its very simple just sign-up and start using this, however this is currently in beta phase. Its very much like Goowy, another flash based OS, but the review says Jooce is much better. 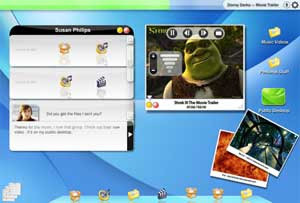 Users can have their private and public desktop. Public desktop can be shared with the friends and family. Find free .net control here.